“We are not focusing on hiring. We have decided to stick with what we have and focus to keeping them”. Sounds logical but wait: what to do if you have is a disengaged workforce of what can be best described as “B” or “C” players? Now is the time to take inventory of your team and look for opportunities to upgrade the B’s and C’s to A’s. At our Calgary workshop we had a volunteer offer up one of her divisions as a sample to the group. She candidly shared with us that two-thirds of her employees are “O.K, alright and don’t hurt the business”. When asked about the other third she replied, “half of what is left I wish I had a basket full of and the other half I wish I could stick in a basket”. I remind you that this is an organization that has decided to have a hiring freeze. Can you see where this is going? What Does It Cost You To Not Upgrade? So what does all this mean to you? Do the math. 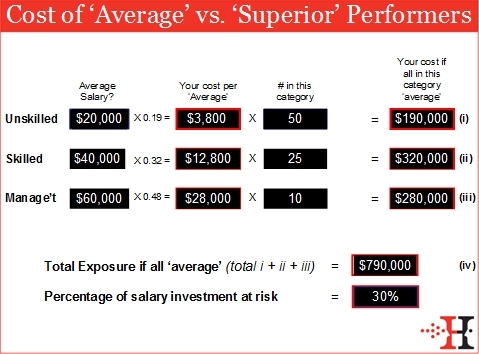 To help you along the way click here to download our “Cost of Average vs Superior Performers” worksheet. Let’s say that your unskilled workers earn an average of $20K annually. To calculate the difference between average and superior workers in each of these positions estimate the cost of production lost to average workers at a minimum of 19% of their salary – which comes to $3,800 per position! So for every one of these positions where you have an average rather than a superior worker, it’s costing you a minimum of $3,800 and, as you have 50 unskilled workers the total potential impact is $190K . Let’s say your 25 skilled workers earn an average of $40K, then the potential impact is $320K. And finally, if your 10 managers earn an average of $60K the total potential impact is $280K. Add these three figures together and you can see that although we’re dealing with a fairly small organization, the cost to them can be enormous – the difference between profit & loss, and maybe even survival and extinction during these turbulent times. Take a crack at it with your own numbers – are there more or fewer people in each category? Do the salaries differ? Regardless of how large or small your organization there is good news here – look at the three central red boxes. The message is clear: for every single position where you make decisions or take actions that raise performance levels from average to superior, you have an immediate impact on your bottom line. No time is better than the present to focus to upgrading your team. And now you can present a business case showing why making an investment in this project is going to be the best money your organization spends this quarter. Each assessment tool is designed for a specific purpose. Use it for that purpose and she'll be able to rely on the outcome but don't try to use it outside of its range.